Hi friends. I hope you seeing this via the FB link provided but I just can't guarantee it. With that said, please come to the website, it is as easy as clicking JOIN THIS SITE. Facebook is going down, and fast, and I know you have all seen it and heard it but the reality is that, it is a huge social medium for bloggers, businesses, etc. So it hits us really hard. People undoubtedly prefer everything in one place. You can go to Facebook and get your links to anyone you like, all on one website but you are no longer able to count on that. Please consider joining me here, and/or via email updates. There is NO spam, simply notifications 3 times a week of my new posts in your email. It is so discouraging, but I am grateful for still being able to chat more "real time" on my fan page there. Remember you can also find me on Pinterest, Instagram, and Twitter. Disclaimer: I am NO sculptor so no dogging on my lack of ability to create a proper egg shape, GOT IT? HAHA! Now for these eggs. My husband was CONVINCED he could come up with a peanut butter filling that was far closer to the real Reese's peanut butter filling than just a creamy peanut butter. He wanted the texture and consistency, so on his day off we went at it. I think we hit it pretty good. It definitely isn't just creamy peanut butter, and the consistency is fairly nice. 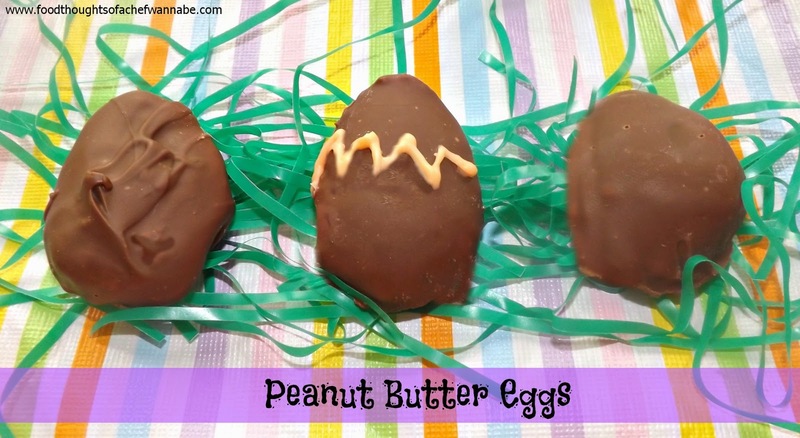 So if you think this is just another peanut butter egg recipe, it is, but it ISN'T! Thank you George for your constant inspiration, challenges, love, and support, I never take for granted how blessed I am to have a husband who is in complete support of my life and my life ambitions. So, there is only ONE small thing about these eggs. You need to just free form them, and when you do, put them on parchment and FREEZE them. Because the filling is a bit of a different texture, they take a bit to freeze well enough to dip. I would suggest putting them on a fork and then spooning chocolate over the top. I might even secretly suggest DOUBLE dipping them! Just make sure you allow a couple of hours for them to set a bit in the freezer before dipping. No fridge.....FREEZE. Mix by hand until all ingredients are combined. And JUST IN CASE you were going to ask if you could just use chunky peanut butter, the answer is yes, but you still need to add the chopped peanuts, trust me. Form into eggs, however you choose and place on a parchment paper lined baking sheet and FREEZE for at least 2 hours before dipping. 2-3 cups of milk chocolate chips, your choice. Melt your chips in a bowl, 30 seconds at a time in the microwave. When melted, if you need it a bit more runny, add a few drops of vegetable oil and stir well. You can add it until you have the right consistency that you prefer for dipping. Like I said, this feeling is a WEE bit soft, but will be so worth your efforts, trust me. I, again, suggest using a fork to dip, so the entire egg is supported if it is flat on one side. If you formed regular shaped eggs, you will be find! Place back on parchment and refrigerate for 1 hour to set. Decorate how you want, keep them smooth, swirl them on top or use colored melts, melted down to decorate. Maybe even some sprinkles! Store in the fridge until time to serve! !